In recent years, physicians and researchers have increasingly turned to glowing dyes to look beneath the skin. An eye doctor, for example, might inject a dye into a patient's blood before shining a bright light in her eye. The dye causes the blood vessels to glow, providing a roadmap of the patient's retina on a computer screen. 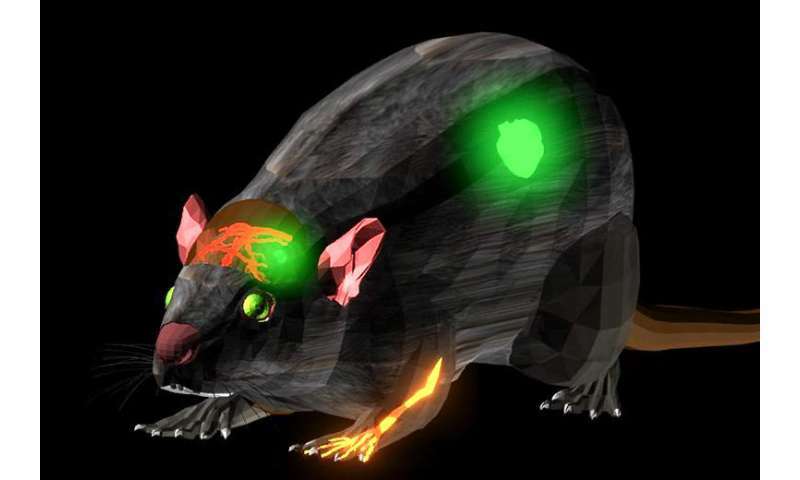 This fluorescent imaging can help to pinpoint tumor locations near the skin's surface in a variety of cancers, such as head and neck, melanoma and breast cancer. "The difficulty is how to make a dye that is both fluorescent in the infrared and water soluble," said Alex Antaris, a graduate student in Dai's lab and the first author on a recent paper in the journal Nature Materials. "A lot of dyes can glow but are not dissolvable in water, so we can't have them flowing in human blood. Making a dye that is both is really the difficulty. We struggled for about three years or so and finally we succeeded." What's more, the new dye produces images that are sharper and more detailed than before, increasing their potential value to medicine and surgery, Antaris said. "This could enable clinical use of fluorescence imaging to reach unprecedented depth for diagnostics or imaging guided surgery," Dai said.